Pieter Pourbus has been forgotten over time, but a joint effort by a Belgian and Dutch museum are changing this. Their exhibition drew crowds at the Groenlinge Museum, Bruges. Now it does the same at Gouda’s museum – till the 17th of June. Why Gouda? Pieter Pourbus was born here, around 1523. He painted one of his alter pieces for Gouda’s Sint Janskerk (Saint John’s church). This church, known for its stained glass and on the UNESCO heritage list, lies next the museum. Pieter Pourbus may have known the museum as the Catharina Gasthuis. It was no guesthouse, but a hospital. Now a museum, it sprawls over several period buildings. Pourbus’ religious paintings are exhibited in the second part of the exhibition. Included is what experts deem his best altar piece. It was created for Gouda’s Sint Janskerk in 1552. A fire had caused extensive damage to the church. So the local guilds commissioned several painters, including Pourbus, to create new altar pieces. These are exhibited in the museum’s chapel. Yet it is not Pourbus’ religious works which impress. It are his portraits, which visitors come across first. They are the real gems of this exhibition; most now belong to the Groenlinge Museum in Bruges. Bruges? Yes, Pourbus was born in Gouda. He undoubtedly first trained as a painter here. Yet, he left Gouda for Bruges. Why he quit Gouda remains unknown. Perhaps Bruges’ reputation as a wealthy, international town attracted Pourbus. Pourbus became a master student of Lancelot Blondeel. Blondeel was a Renaissance man: painter, architect, cartographer. After marrying Blondeel’s daughter, he joined Blondeel’s workshop. Like his father-in-law, Pourbus another Renaissance man: painter, sculptor and cartographer. The museum only exhibits examples of his religious paintings including its wonderful Annunciation and captivating portraits. Take the ones showing Jan van Eyewerve and Jacquemyne Buuck. Their portraits date from 1551 and were likely ordered to commemorate their marriage. In the background of each portrait are scenes from busy Bruges. 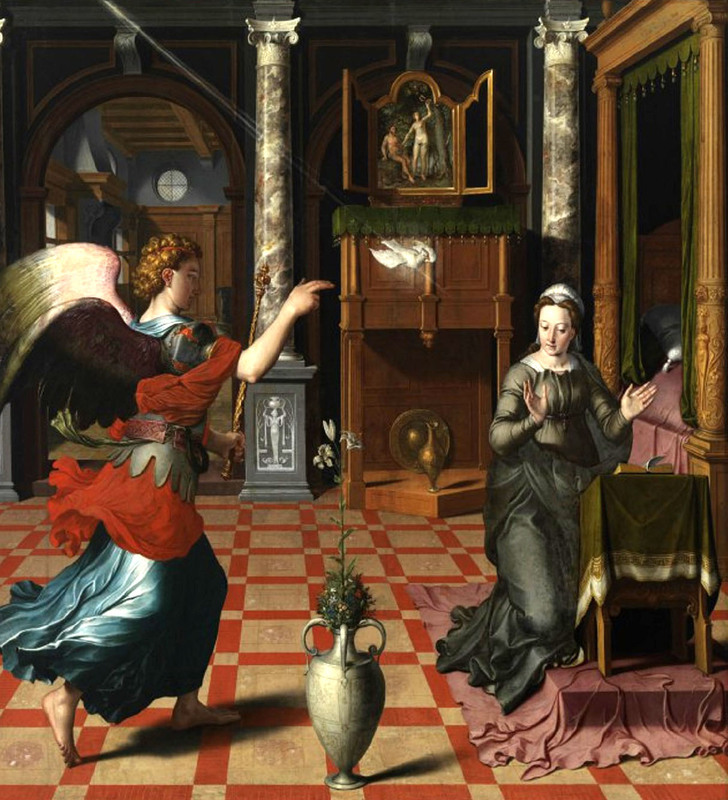 The scenes were carefully chosen by Pieter Pourbus. Van Eyewerve was a wine merchant. Behind him are a medieval crane unloading a ship, a number of casks, people testing the quality of the wine. In Buuck’s portrait, there are a church and wonderful house, a shop and playing children referring to the role of a good housewife. In many of his paintings, Pourbus mixes Medieval and Renaissance influences. He hints at his sitters’ roles in society; wealth, status, importance. But he also uses perspective and paints individual persons, revealing some of their character traits.